The Rotel receiver has annoyed me for years with its few seconds of silence after mode switches (like Dolby Digital to PCM during a TV broadcast). It’s volume behavior was bothersome, with no way to compensate for different levels between sources. It’s old and has had one small power supply component fail (at the time I decided to have it repaired rather than replaced). A new one would offer HDMI switching and scaling. The InFocus projector was old and growing dim, and did not support any HD formats. It looks good for DVDs. The long component video (YPrPb) run to the projector makes for a difficult color balance. The Panasonic plasma display still looks great, and supports 720p HD, but it didn’t have an HDMI input port, necessary for things like Blu-ray Disc. The Logitech remote was working fine, but its display screen has deteriorated. 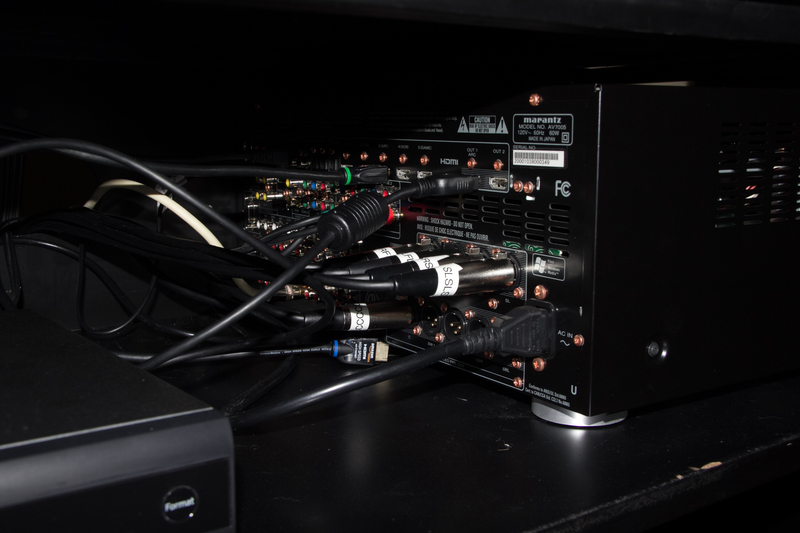 I thought HDMI would reduce my nest of cables by eliminating a lot of component video and digital audio cables, plus a projector upgrade would give us true HD (even 3D) for movies. 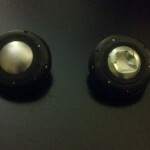 New B&W tweeter on the left, with the crunched one it’s replacing. B&W does a pretty good job with a USA parts and service company. 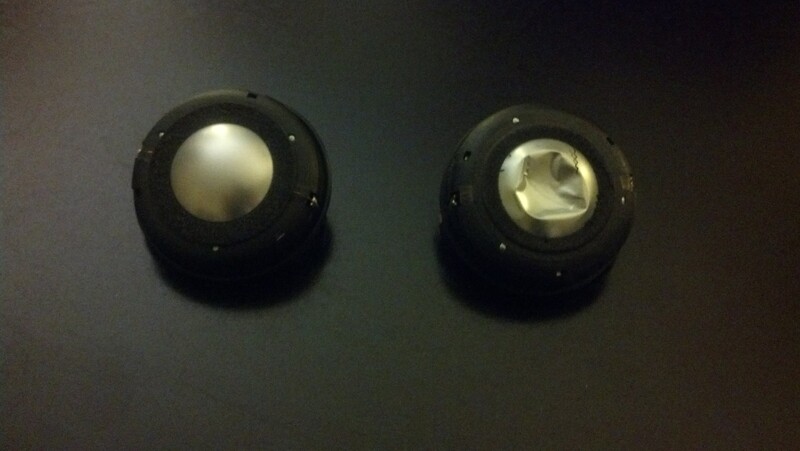 The tweeters on these speakers live in a little nodule at the top of the tower. New ones were moderately easy to plug in, though after several years getting the tweeter housing open and back together took quite a bit of force. My Panasonic plasma screen was made in January 2007, and long since discontinued. When I purchased it, I never bought the optional HDMI terminal card, since I couldn’t route HDMI. I was concerned that the add-on board would be “unobtainium” as well. It turned out to be available and in stock at amazon.com. Installing the card was definitely a two-man job. I roped my friend Preston into spending a couple of hours with me moving stuff around. We got the plasma display off its base, and the terminal card installed with no great effort. Yay! I decided to go with separates: Outlaw Audio’s Model 7500 power amp looked solid and had great reviews, plus it’s priced quite a bit below its peers. I’m thinking that this power amp may be the last one I ever buy. It should live forever even when I replace preamp/preprocessor units. 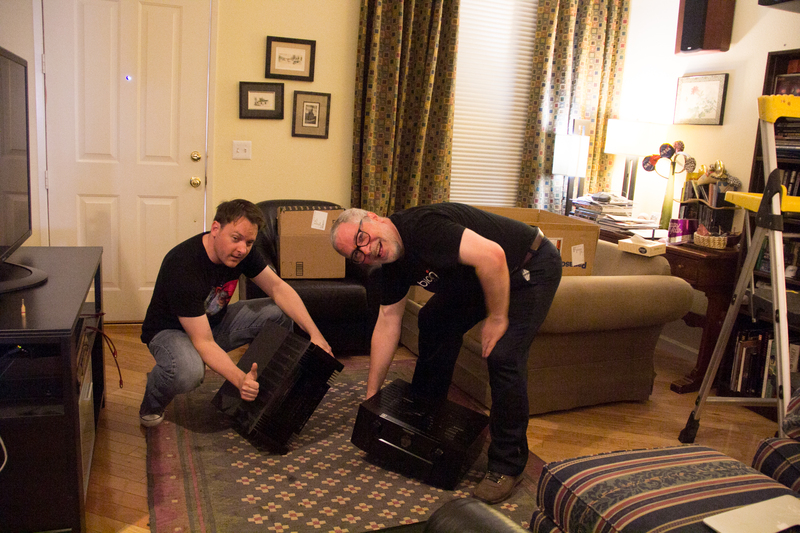 Preston and Mojo show off the new audio separates, ready to go into the A/V cabinet. For a pre/pro, Outlaw also had a good deal on the Marantz AV7005. It had great reviews and all of the inputs and setup I needed. With Preston’s help, we wrangled the power amp into a nice spot on the bottom of the A/V cabinet. I had ordered a set of five balanced audio cables with XLR connectors from Outlaw along with the power amp and receiver, 0.5 meter each. Oops! No chance they would reach through the holes in my A/V cabinet. They’re really only useful if you can physically stack the pre/pro on top of the power amp. So my fallback was to use some of my now-unneeded RCA interconnects and use the unbalanced audio connectors on each unit. Sometimes that worked. If I held the interconnects just the right way, I wouldn’t get a ground-loop buzz. Well that’s stupid! That’s exactly the problem that balanced interconnects solves so elegantly. So where to find five interconnect cables long enough to connect the pre/pro to the amp? This is not a mass-market item. It finally occurred to me that Fry’s Electronics might have the connectors and wire and I could make my own interconnects. (I’d already struck out at Radio Shack on XLR connectors.) Indeed Fry’s had male and female XLR connectors, and enough stock for me to buy five of each. But finding two-conductor shielded cable at Fry’s was hopeless. 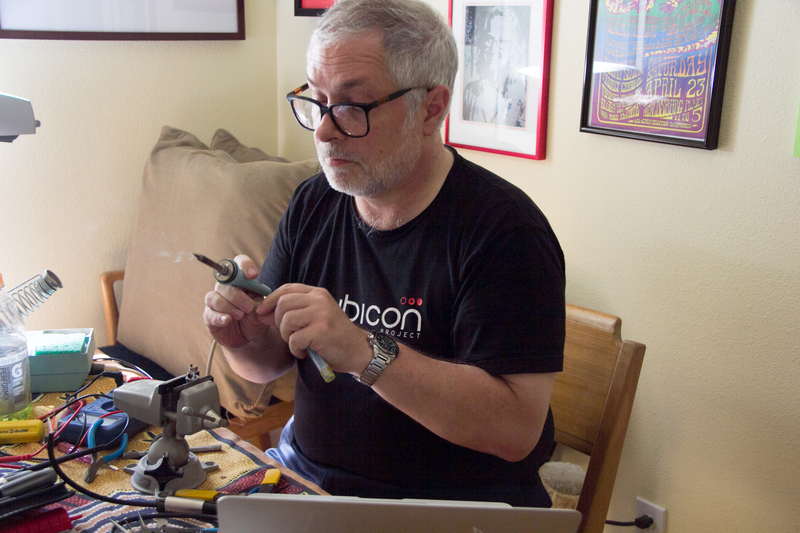 Mojo making XLR balanced audio cables out of a 25-foot microphone cable and XLR connectors. Indeed, back to Radio Shack, where they didn’t have two-conductor shielded cable either. But they did have a 25-foot microphone cable, with a male XLR on one end, and female XLR on the other! In my devious mind, I would cut that cable into five 5-foot sections, and build five balanced interconnects. I could even reuse the existing connectors on each end of the microphone cable. The interconnects work beautifully. No buzz, easy routing, positive connections. The AVR side of my homebrew balanced interconnects. 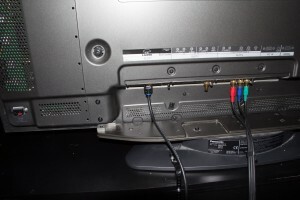 A word of warning: Outlaw Audio agreed to take a return of the five balanced audio interconnects, but stated that their policy doesn’t allow cable returns. Be careful when ordering cable from Outlaw! Now with audio connected, time to plug in the plasma and check out the receiver’s setup menu. I hooked up the new plasma HDMI terminal to HDMI “monitor 1” output on the AVR, and was rewarded with … nothing. The screen remained black, though it would flash with changes, and indicate signal present. Connecting the HDMI cable directly to the TiVo gave me a fine picture. 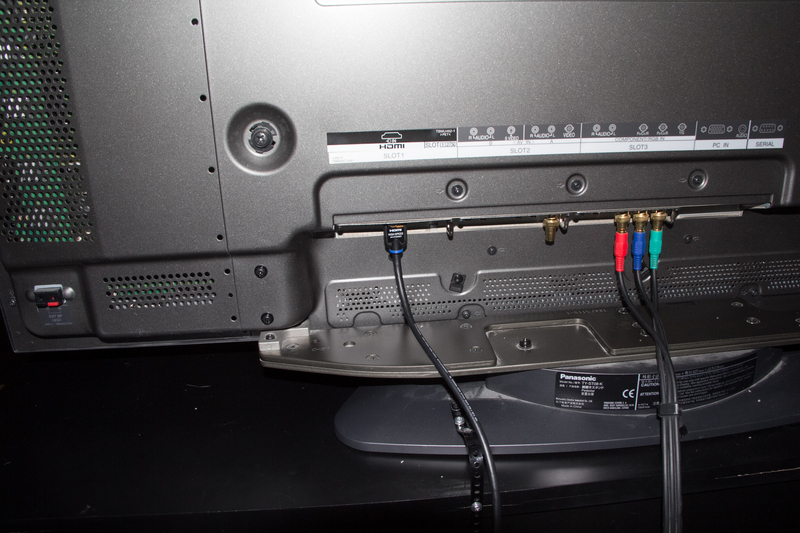 New HDMI terminal goes into slot 1 of the Panasonic TH-50P9UK plasma display. AVS Forum has been a great source of advice during the process. After attempting an “HDCP Reset,” I found that I could get video from the TiVo, through the AVR, to the plasma, at startup, for about one minute — even with the AV7005 menu superimposed nicely. After that, the display goes back to black and stays there. I’m quickly learning that HDMI is not the promised land I had hoped! Compatibility is a serious problem between sources, switches, repeaters, and sinks. Some experts have found ways of working around some of these problems by using switches and tricking the sources into seeing a different EDID (I’m guessing that’s Effective Device ID). I’m still working this problem, and this post is already way too long. I’ll continue my trials and tribulations in new posts. Update: Saturday evening, everything points to the Marantz receiver as having trouble outputting HDMI signals. I started out with an IOGEAR Wireless HD kit (GW3DHDKIT) to get video to the projector. The transmitter and receiver would never sync with each other. I ran out to Best Buy for a replacement, and ended up with a different brand instead: an ActionTec MyWirelessTV. It’s working beautifully. With my three sources, I can send HDMI video with no problem to either the plasma display or the projector via the wireless link. If the receiver is in the middle, all I get are black screens. I’ll post here how my dealings with Outlaw and Marantz go. If I have to return the receiver for service, that’s kind of a big deal! Oh, I like the idea of labeling all the connector jacks with a labeling machine. Since you haven’t gone Blu-Ray yet, I’d think long and hard about jumping in. I’m happy with the HD quality from the streaming services on my Roku. And when I buy content on shiny disks, I’m preferring DVD over Blu-Ray simply because it’s more convenient – it’s easy for me to rip and enjoy on all my digital gadgets. I think for movies and other content you want to “own”, Blu-Ray might make sense. But my feeling is that in the grand scheme of things, its time has come and gone. Indeed, I added an Oppo BD-103 Blu-Ray player, though I don’t yet have any disks. And the new projector is 3D capable. The label maker is a great way to label cables. I’ve kept it on hand just for that. I just bought season 1 of Homeland on DVD because Amazon’s sale price was cheaper than buying it on streaming. That happens often with ebooks and music as well. It makes no sense that physical media ends up cheaper than bits coming down the wire, but it happens way more often than it should. Out of all the devices in our home that can play Amazon video, the TiVo is the worst. It can’t stream, it can only download. Mine is an ancient Series 3, but even the newer Premiere units can’t do streaming. I wonder if they’ve fixed that in their new “Roamio” line of DVRs.